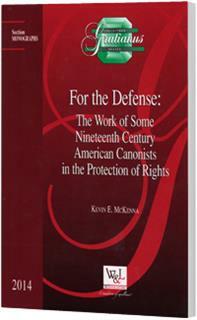 This book is an effort to explore the work of several American canonists whose writings about defects in proper canonical procedures in the disciplinary actions involving clerics, led to some important contributions in the development of law in this area. The results of the intervention of some of these canonists can be seen in the development of procedures related to the assignment of the clergy and removal from office, notably seen in the legislation of the Provincial and Plenary Councils of Baltimore (U.S.). In addition, their writings assisted many canonists in the United States who were attempting to advocate for the rights of clerics. The intersection of pastoral practice, reflection and canonical advocacy continues to stimulate the development of law where justice fostered and rights are protected in the Church's legal system.